Yet another measure to try to decrease car-on-pedestrian accidents at the Intersection of Doom in Rosslyn is in place. The Arlington County Police Department has installed one of its movable-type signs — notably used to tell drivers “Don’t hit the car in front of you” in 2013 — at the intersection of N. Lynn Street, Lee Highway and the I-66 westbound off-ramp. 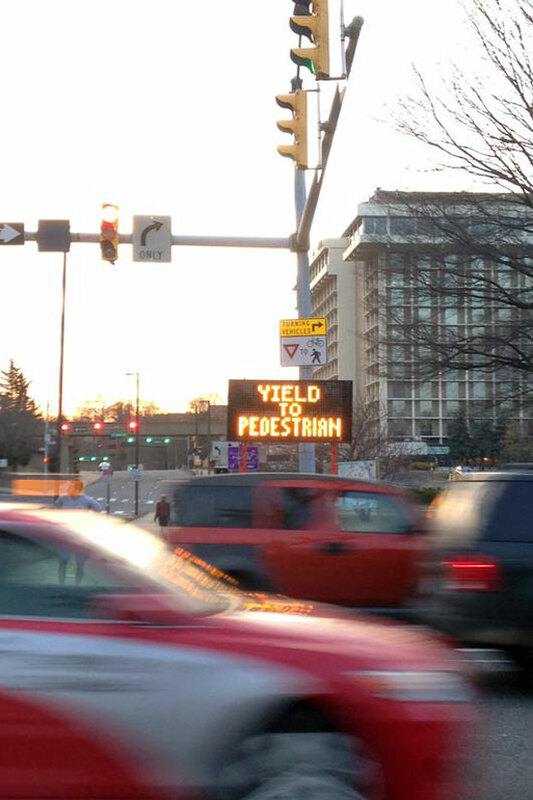 The sign tells drivers to “Yield to Pedestrian,” a persistent problem as those coming off I-66 try to turn right on a green light toward the Key Bridge. The sign is the latest in a multi-departmental effort to reduce accidents at the intersection. Last month, a temporary, no-turn-on-red signal was installed. The timing of the lights has been altered to give pedestrians and cyclists — coming from the Custis Trail to the west and the Mt. Vernon Trail to the east — a head start before cars begin turning. In the future, more permanent measures like taking away a travel lane on Lee Highway and extending the curbs have already been approved and are in design phases. When the sign was initially installed, it was blocking the pedestrian walk signal, but it has since been moved, according to ACPD spokesman Dustin Sternbeck.